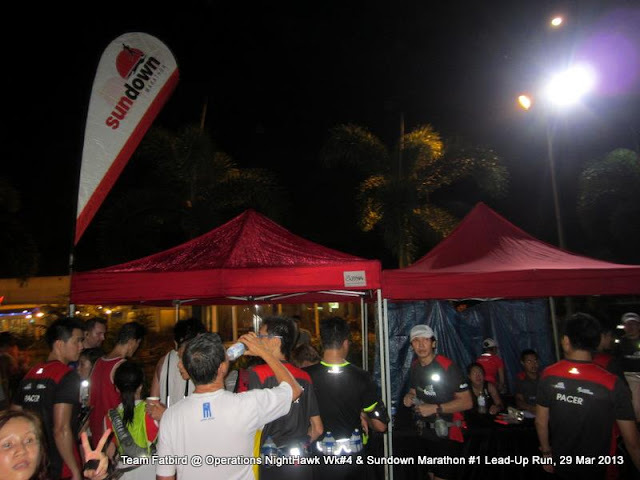 As it was, with the long Easter Weekend, the sign ups for the first Sundown Lead Up Run was already not that great…then came the heavy showers just 2 hours prior to start time, which threatened to sabotage the whole event that everyone has been anticipating. 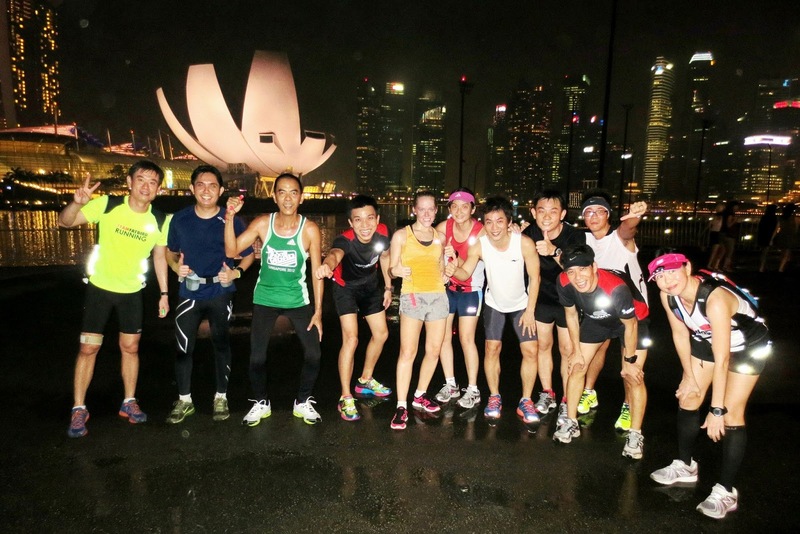 In spite of worries of the rain and lighting, more than 200 runners eventually turned up, and they were all duly rewarded with a scenic, albeit humid run into the City. 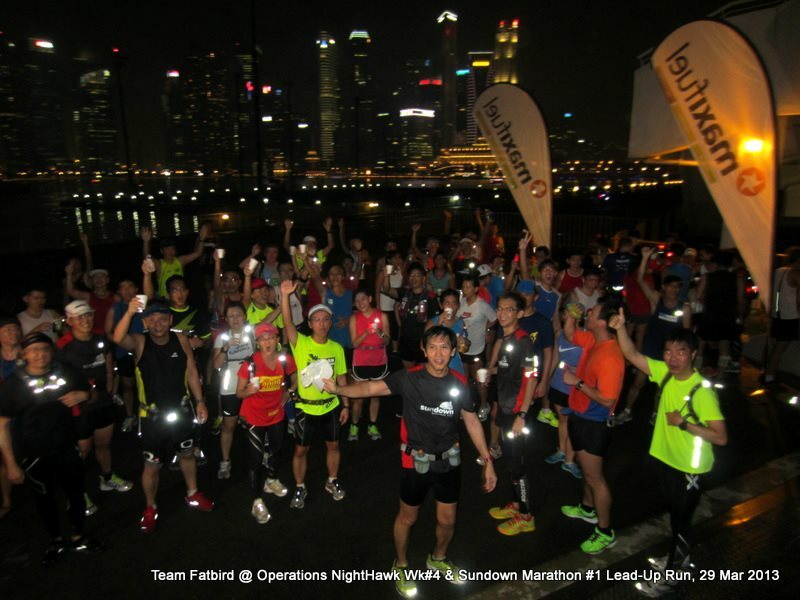 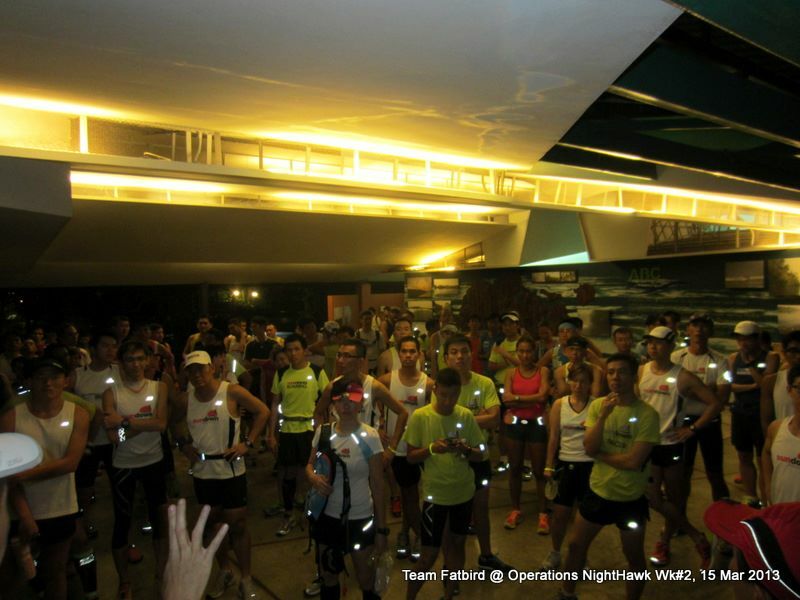 Accompanied by the 40 Sundown Ambassadors/Pacers, the runners were well ushered through the various critical junctions which saw them crossing from Fort Road onto Mountbatten, then along Kallang and Nicholl Highway, before settling down onto the Marina Promenade towards the beautiful Helix Bridge where the Maxinutrition hydration point was strategically located. 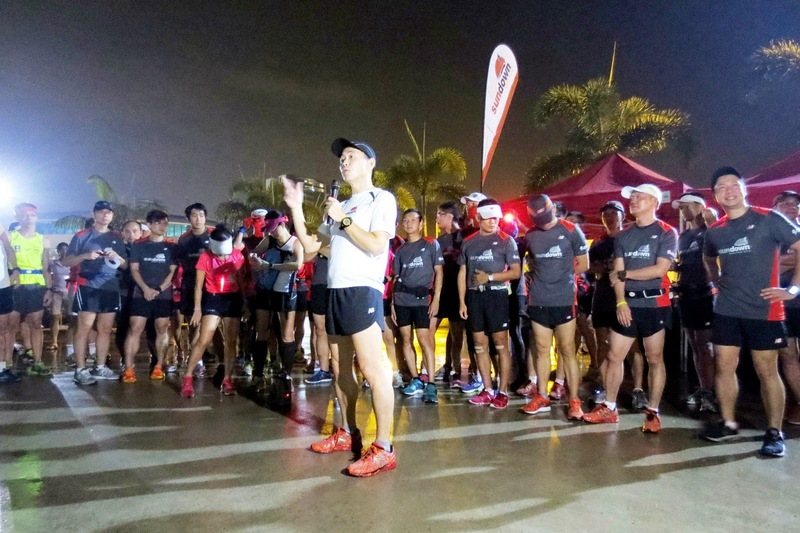 The runners were segregated into their respective timing groups, all with a targeted training pace, each group having 5-6 Ambassadors leading, mid-segmenting and sweeping. 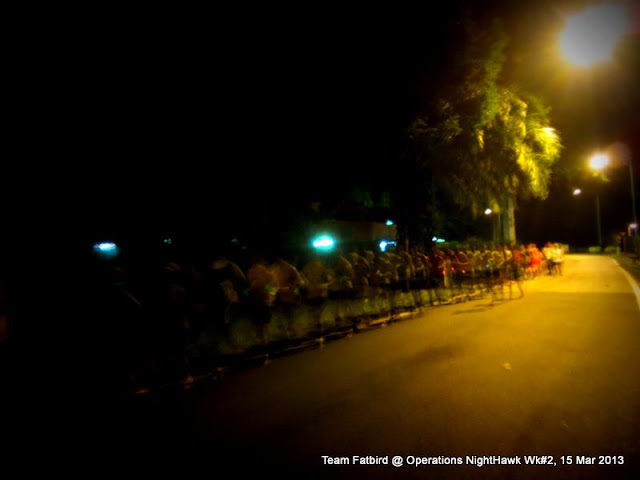 At the same time, the groups were mutually supporting one another for a moving chain of glistening lights in the serenity of the night. For many, this was either the longest distance they were to cover on their marathon journey, or the first time they have run such a City route in the night; all adding to an air of suspense and a sense of adventure. 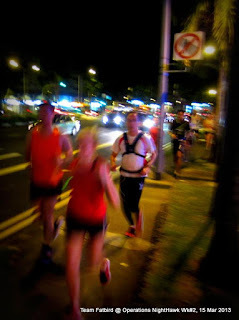 The runners, averaging about 50 in each pace group, ran along in tight-knit fashion; constantly watching for one another. 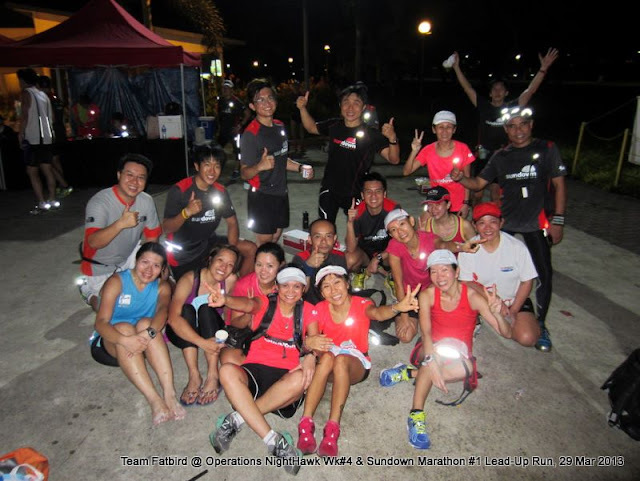 With the guidance and direction of the Sundown Pacers, they were able to keep to their target BaseBuild pace affording a smooth passage, with sufficient time allowed for toilet breaks and even photo stops. All the runners were enjoying themselves, and whenever the groups do pass, they will cheer and clap for one another; adding on to the already high motivation levels, making the run so much easier even though the the distances were not exactly short. 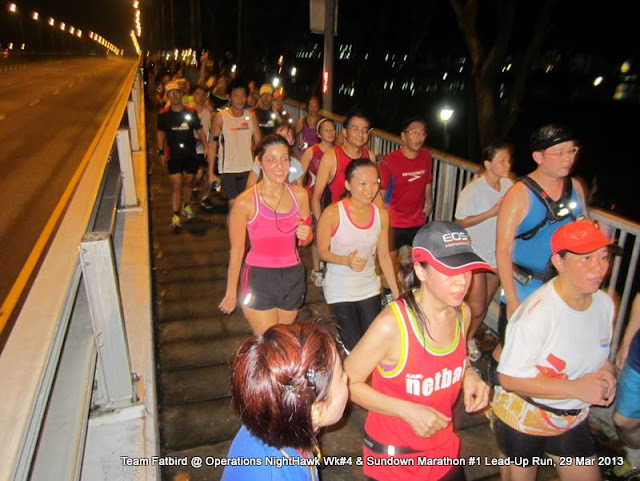 The Half Marathon groups turned back from the Helix Bridge and made their way back to ECP when they came from, making a total of 17km – much to the delight of the first-timers for that distance, giving them new-found confidence to easily conquer the 21.1km on race night. The Full Marathon groups went for an additional tour of the Helix Bridge, Marina Bay Sands, One Marina Boulevard, The Esplanade before coming back to the water-point for a pit-stop. 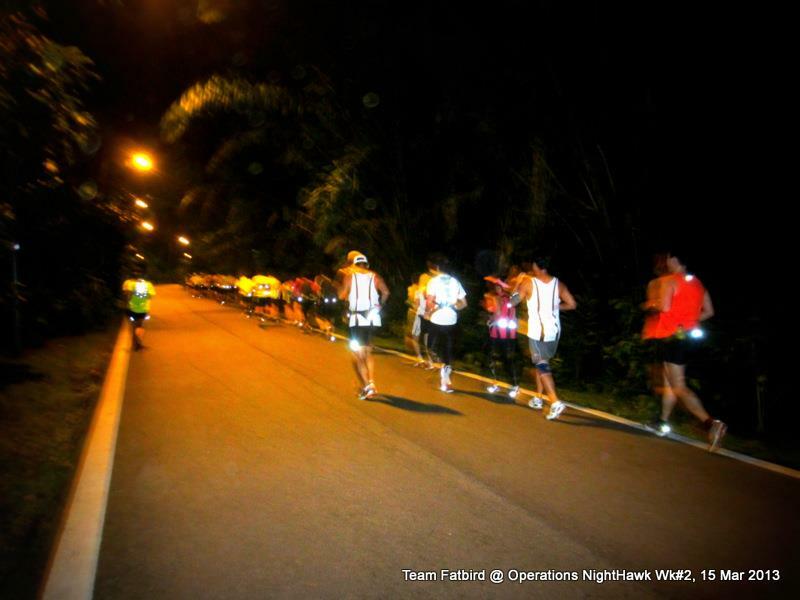 The runners’ spirits ran high as they proceeded back towards Nicholl Highway and then Fort Road. 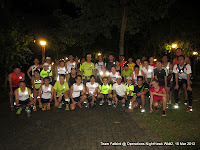 Pacers and Marshals were egging the runners on, some who seemed to be a tad affected by the rather humid conditions post-showers. 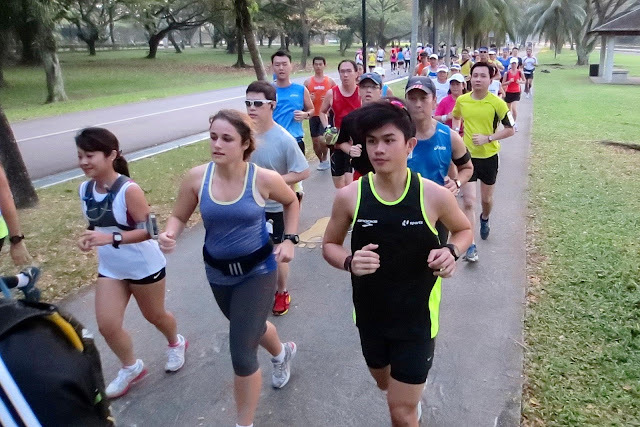 Some of the new runners were also not carrying hydration, affecting their ability to keep to sustainable paces. 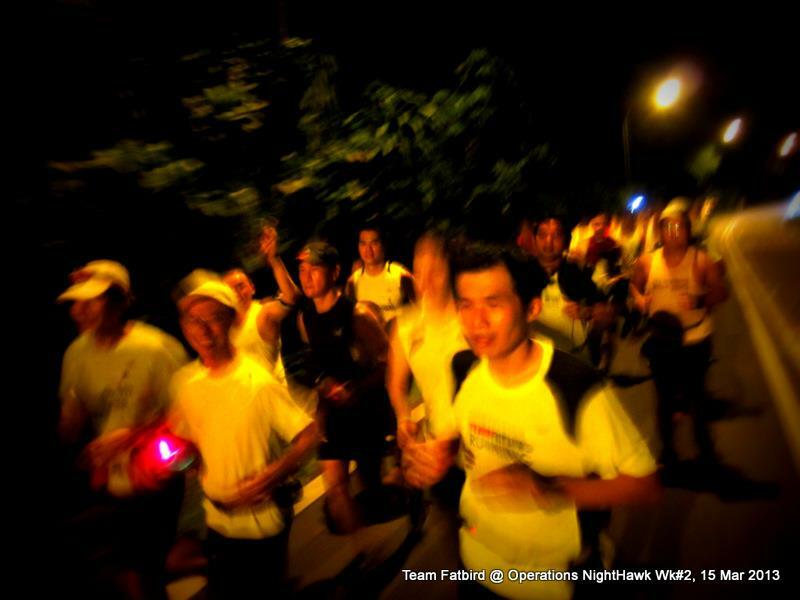 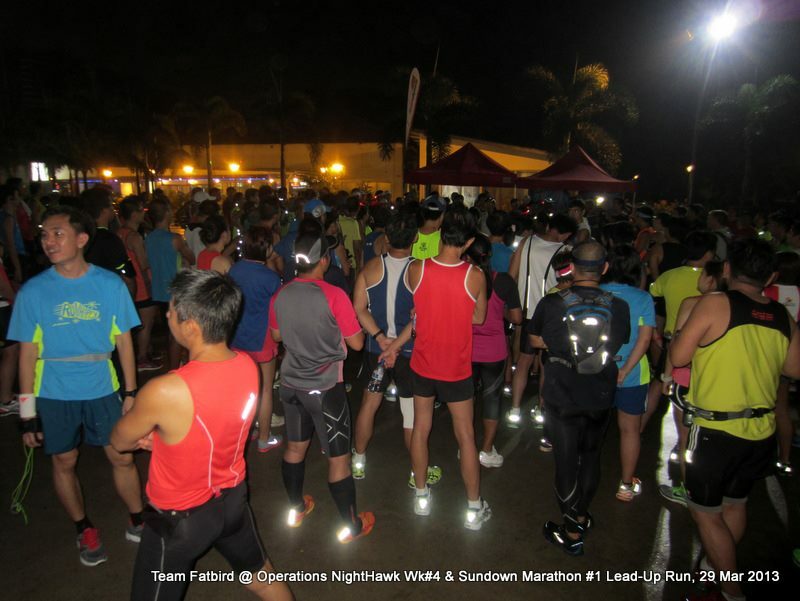 When we hit Fort Road-ECP, the clear runway encouraged many of the runners to pick up speed to power their way to the end point (for HM) and final pit-stop for the FM participants. 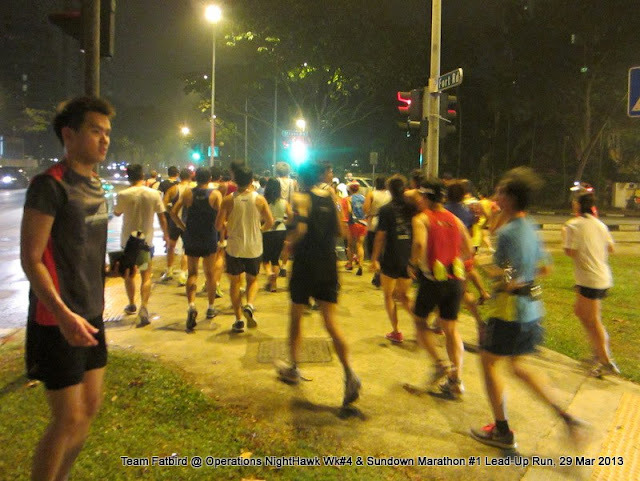 It was a fun stretch where we see various groups of runners running abreast and striding well with good speed, all with at least 15km of running already in them. 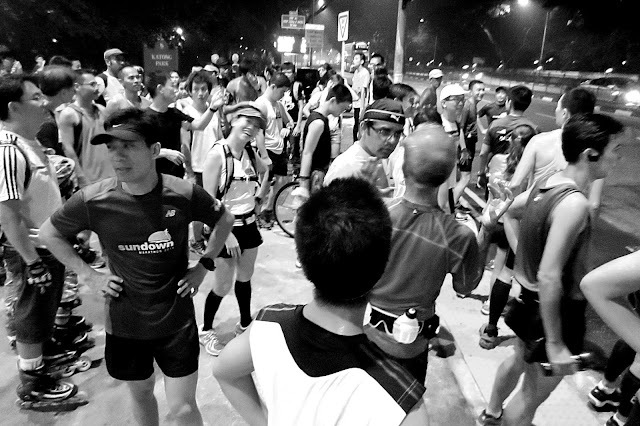 The prized isotonic 100Plus at the Playground kept the runners flying all the way, with nary a walker. 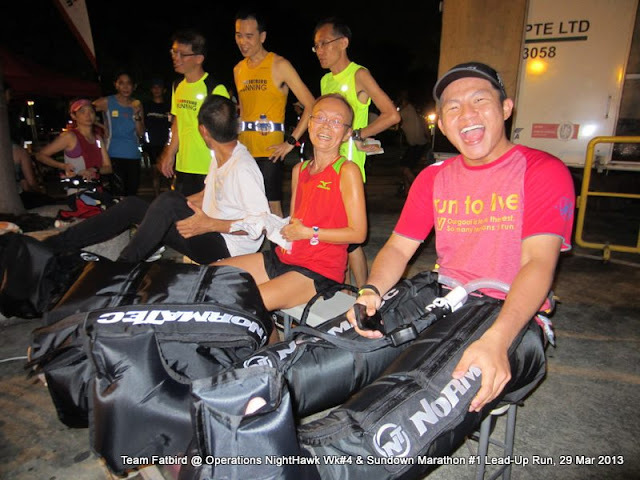 They were amply rewarded with a strong finish for the night, and those who have done their deed went for a special post-run Compression Boots’ treatment from The Ahtlete’s Clinic, helping to relieve their tightened muscles and fatigue in their legs. 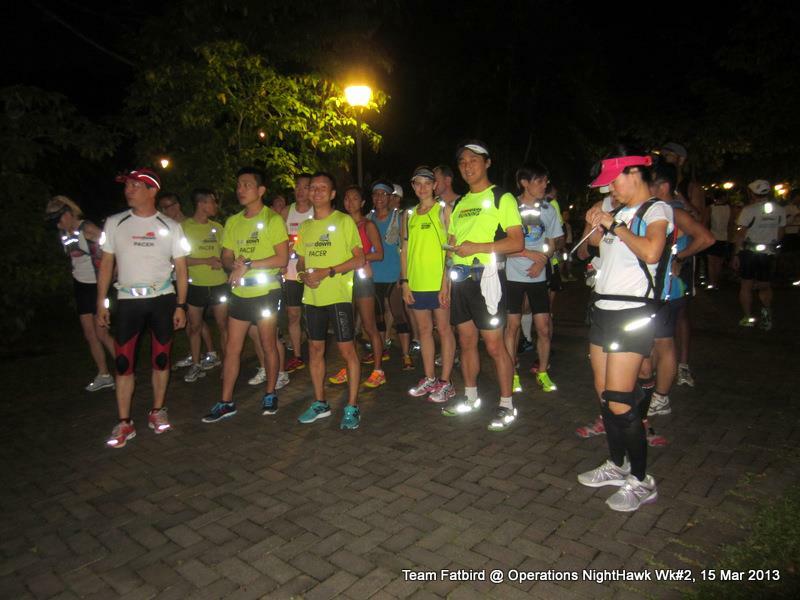 The entire session ended well before midnight, allowing the runners to mingle around for a bit before catching transport back home. 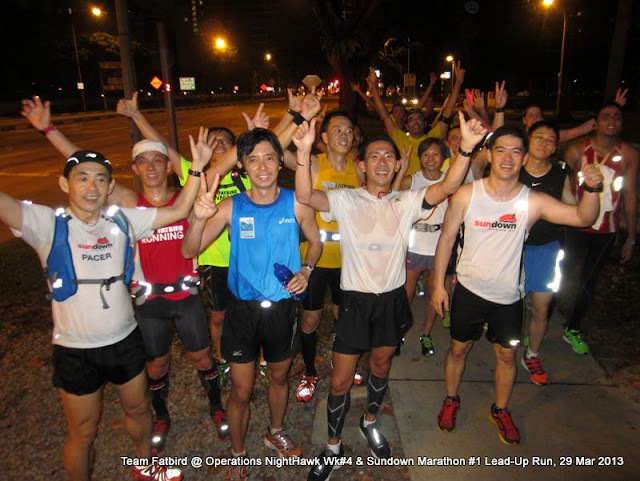 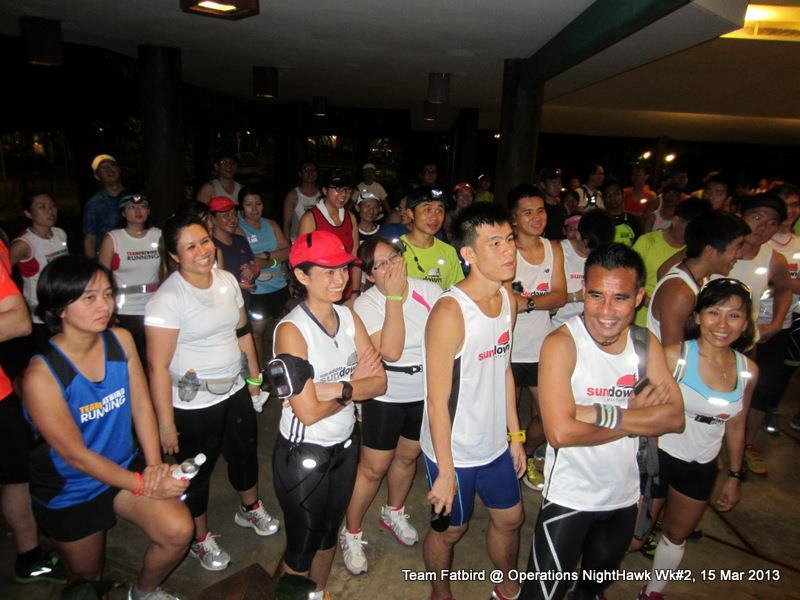 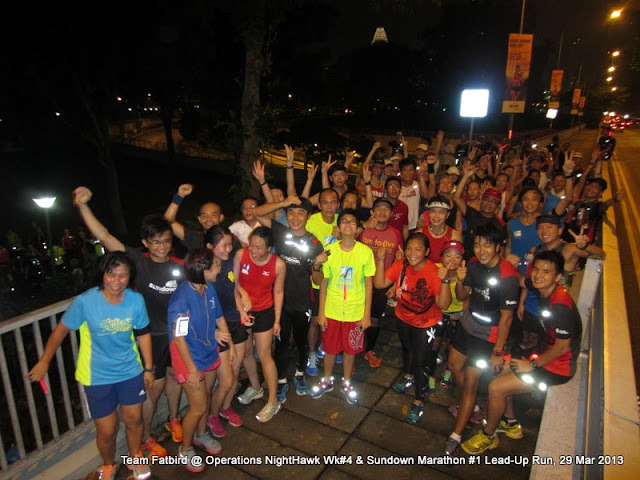 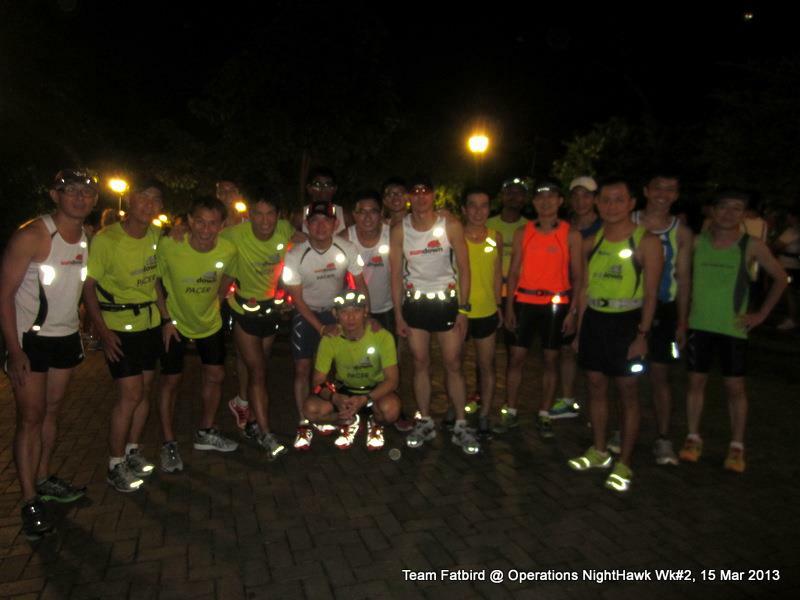 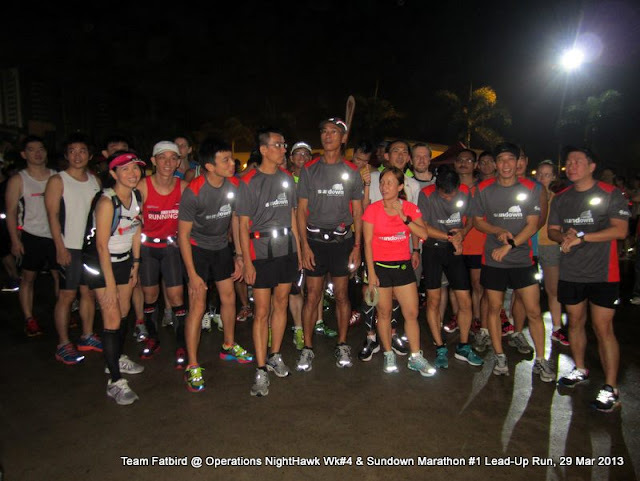 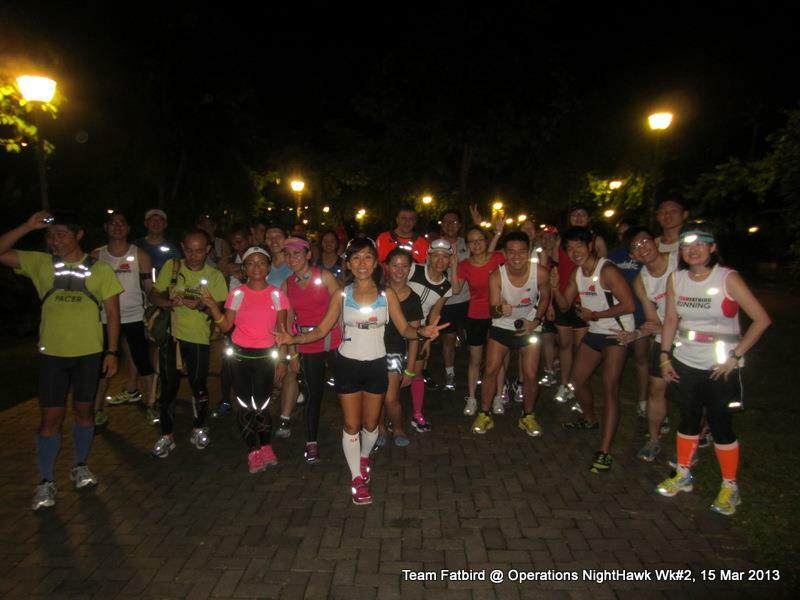 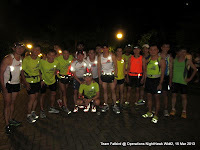 It was a night where we saw the Sundown runners Show Their True Colours with satisfaction and pride. 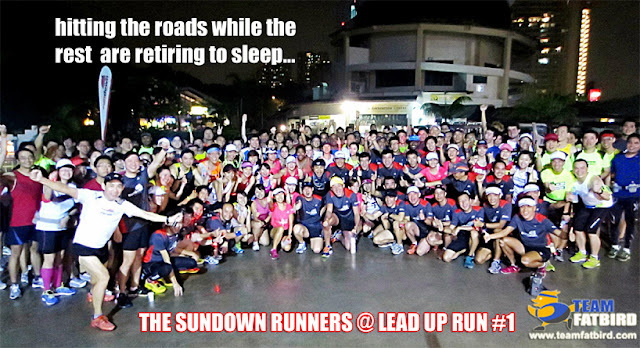 Judging from the post-run feedback and video interviews conducted by the Sundown Organizer, this first lead up run (in a series of 3) went down really well with the participants, with many pledging to return for the remaining 2 progressive lead up runs in April and May. Sundowners, You Have Shown Your True Colours Tonight! 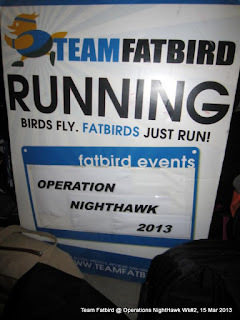 It was nice to see and hear of many trainees from previous FatBird Operations return for more training after getting good results from their diligence and commitment following our structured training programs. The new trainees were all eager to get going, and that ‘fire’ could be seen in their bright eyes during the pre-training briefing session. 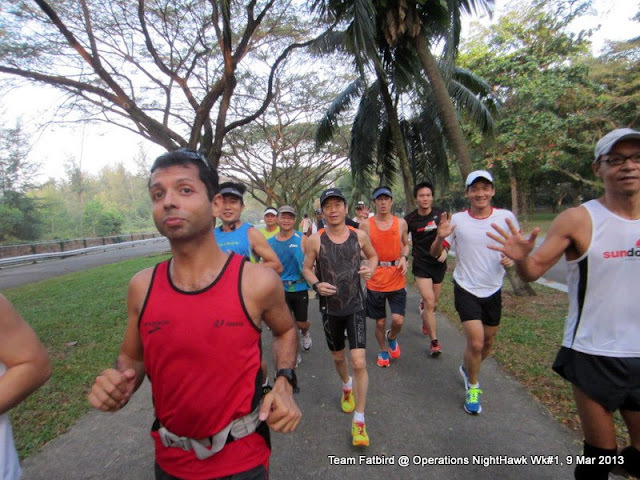 The trainees were divided into respective groups based on their target marathon goals, each group having accompanying trainers and pacers to train alongside with. 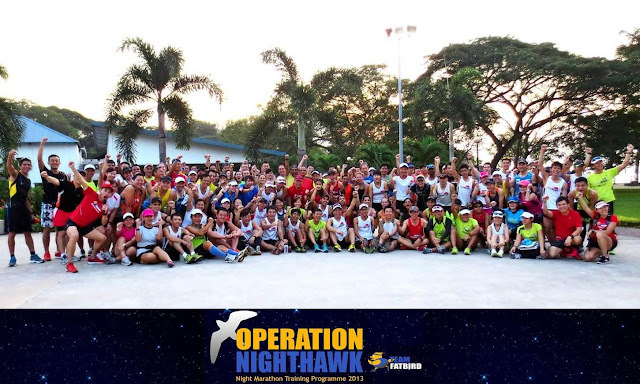 After the customary group photos and shouts of “NightHawks, NightHawks, We All Rawk!” ringing across the Playground, the respective groups were flagged off for their (13-21km) Endurance Run in BaseBuild Zone. 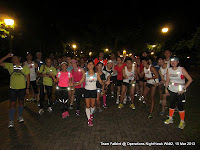 The weather was cooling at the start, allowing for a good momentum to be maintained. 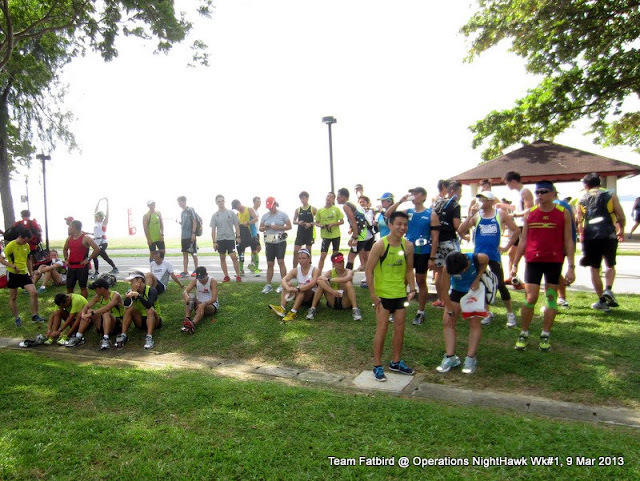 The group trainers and Pacers were showing the way and getting to know the runners in their respective groups. 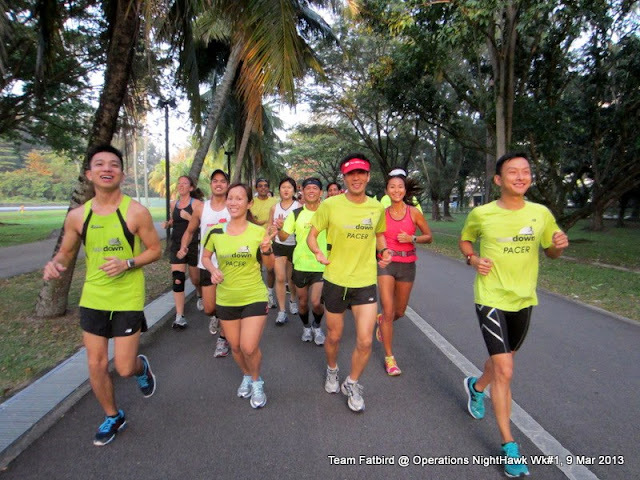 Lots of chatter and interesting conversations abound as there was good interaction among groups of like-minded runners getting together for the first time to run together for about 2hrs. 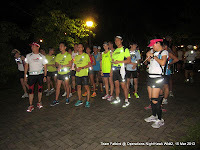 There was good shade in spite of the sun rising up for the second half of the run – many of the runners had hydration with them which helped loads in terms of keeping up with the pace. 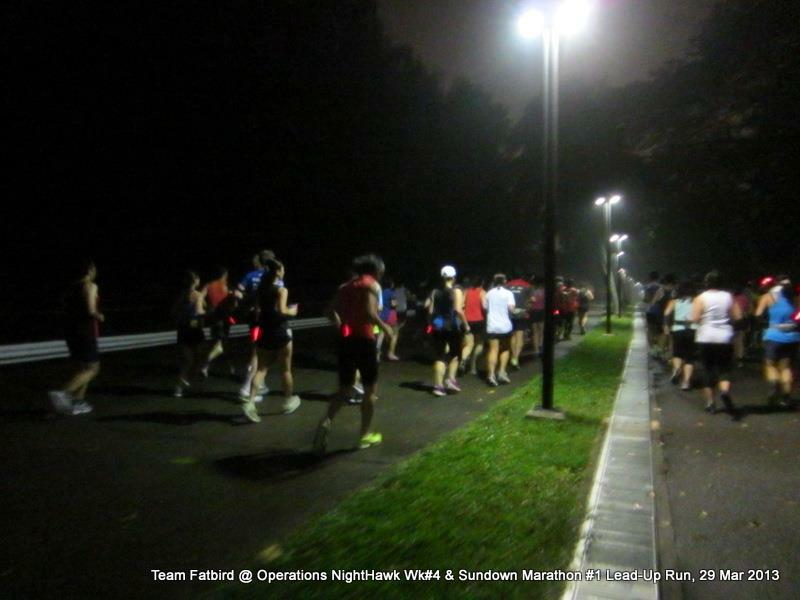 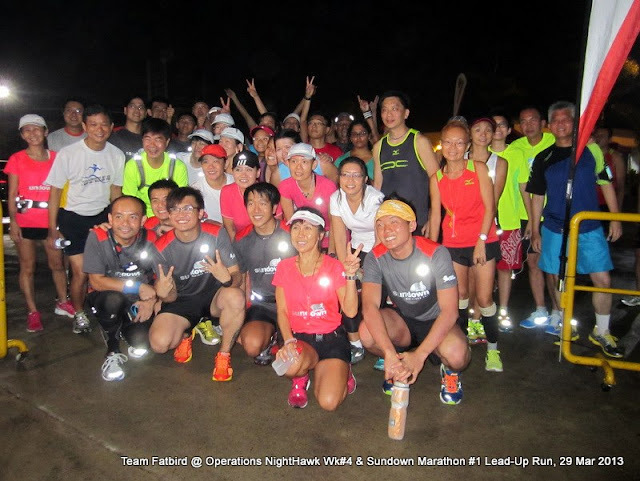 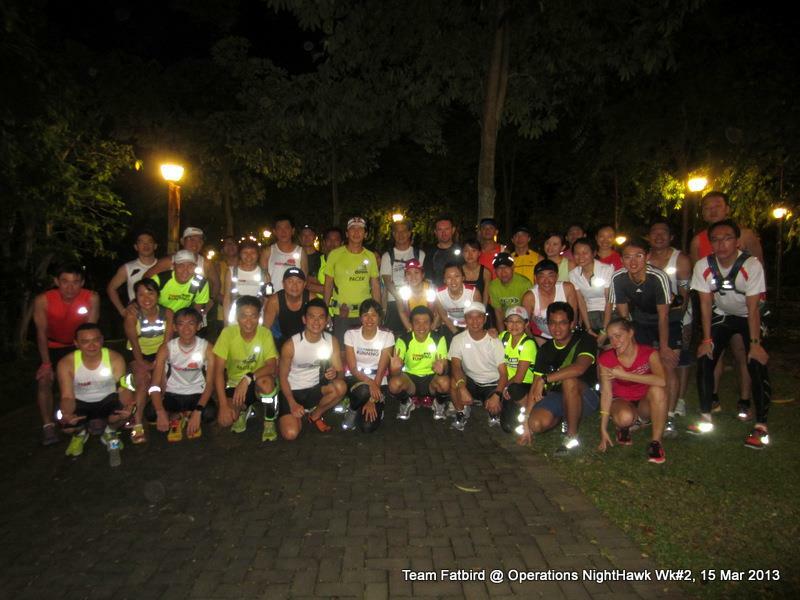 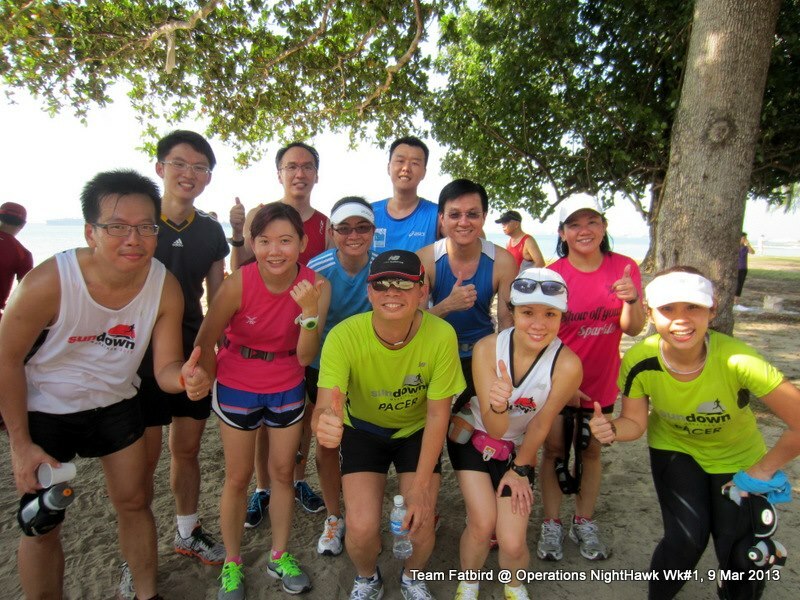 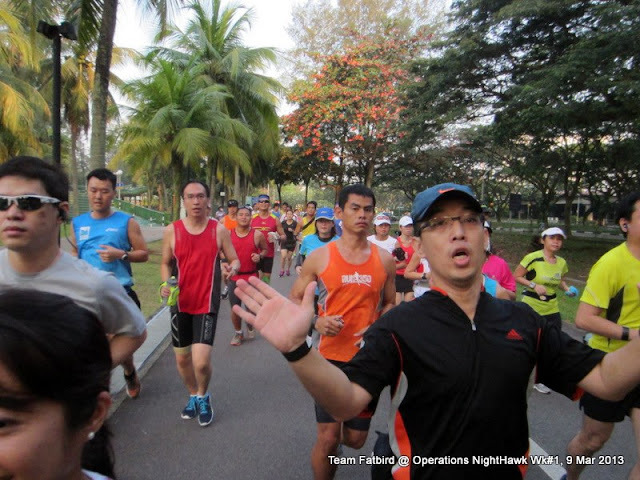 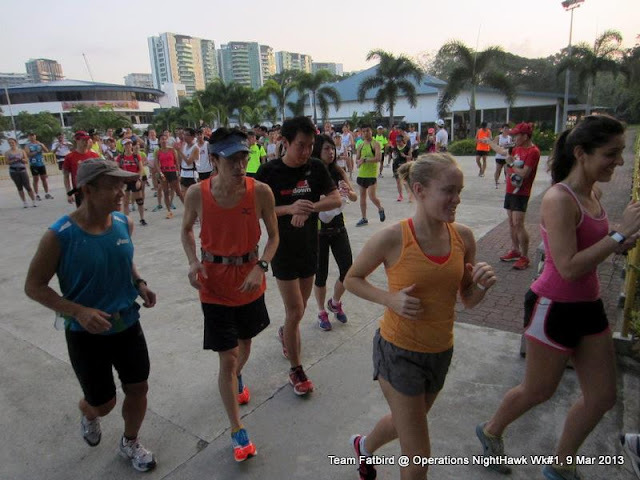 All the runners returned in groups, mostly as intact as when they first started off earlier – a sense of satisfaction and smiles on their faces as they felt a small sense of accomplishment in completing their first NightHawk session. The stage is set now for an exciting journey ahead as we prepare for the first night LSD run in session #2. 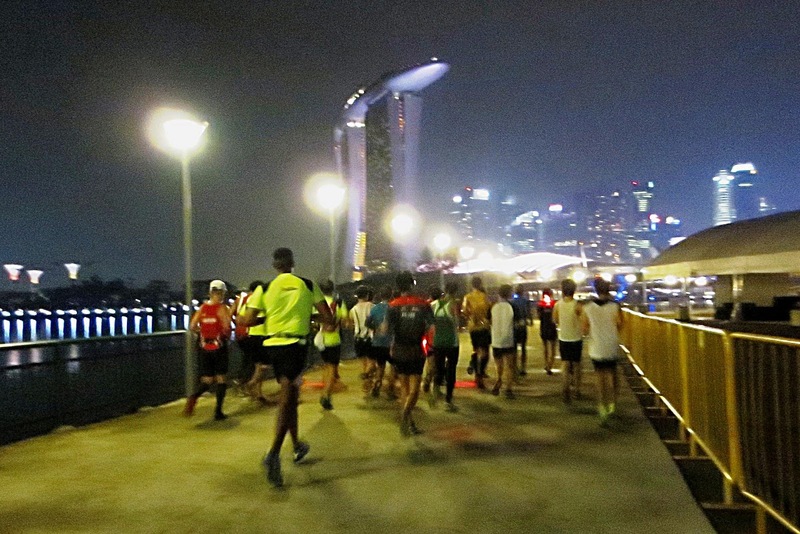 The participants will convene this time in on one of Singapore’s greenest lungs, donning blinkers and light sticks for what will be one “Wild Night Run”. 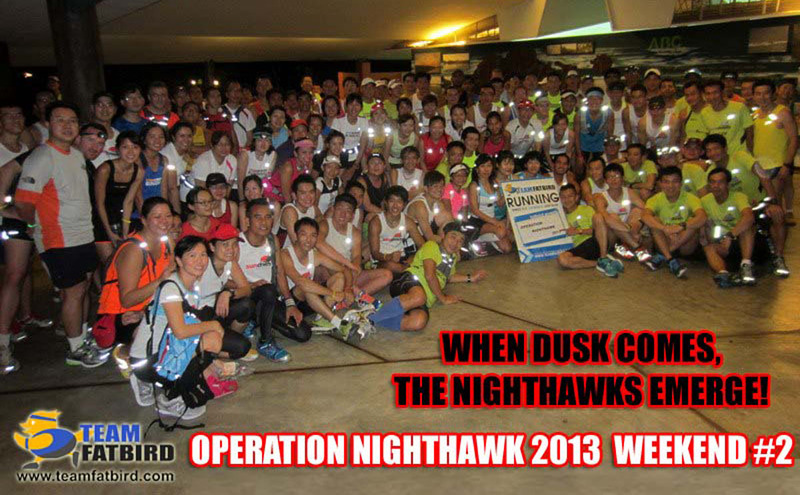 When Dusk Comes, The NightHawks Will Emerge! 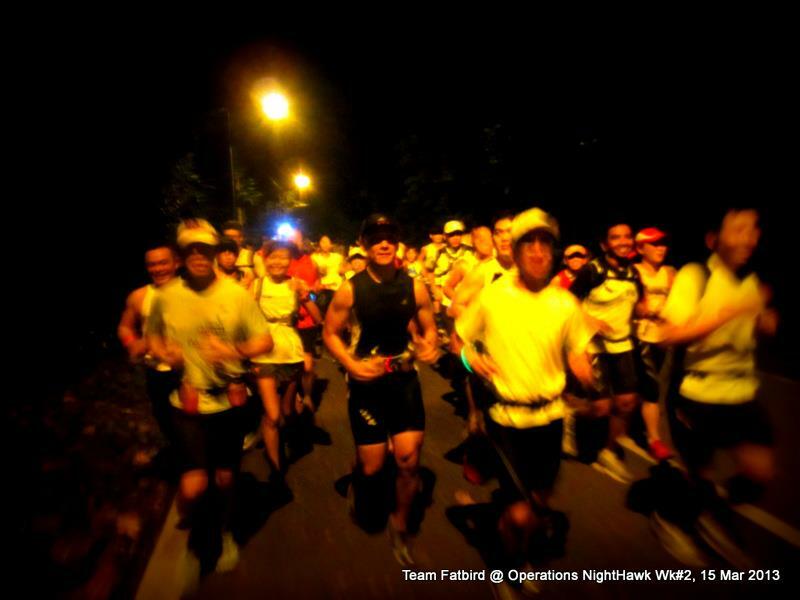 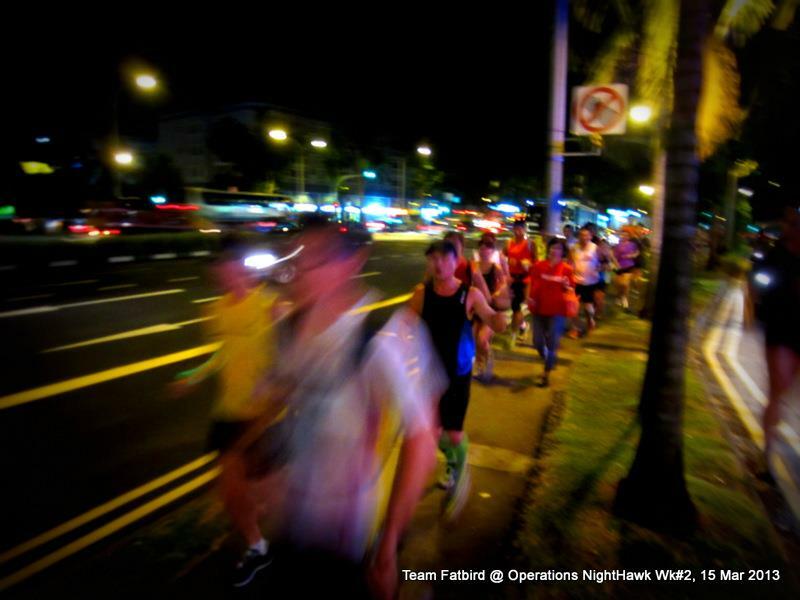 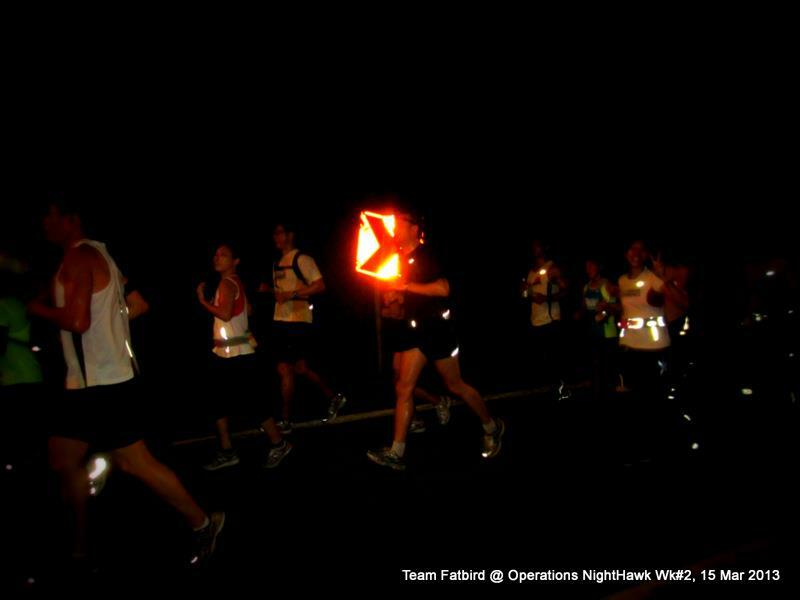 There are still available training slots for Operation NightHawk which you can REGISTER HERE. Come fly the friendly skies with us. 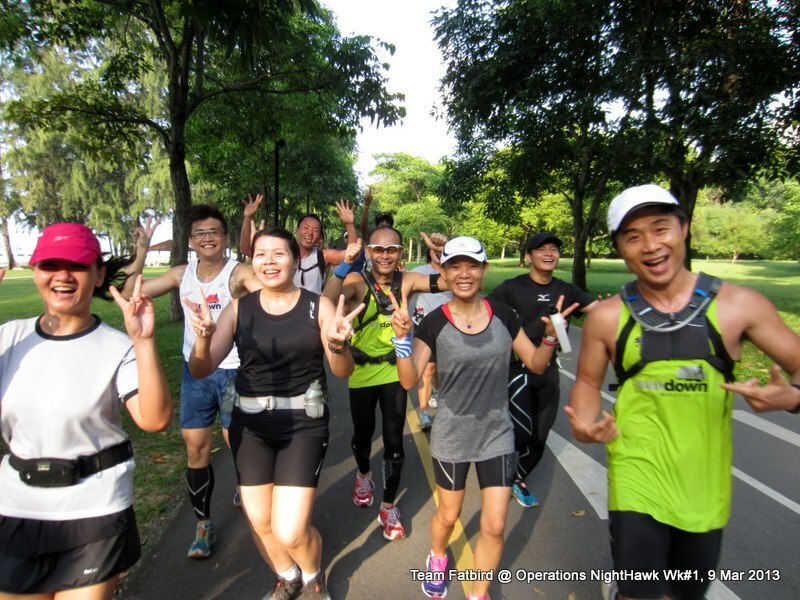 Run With Sam! 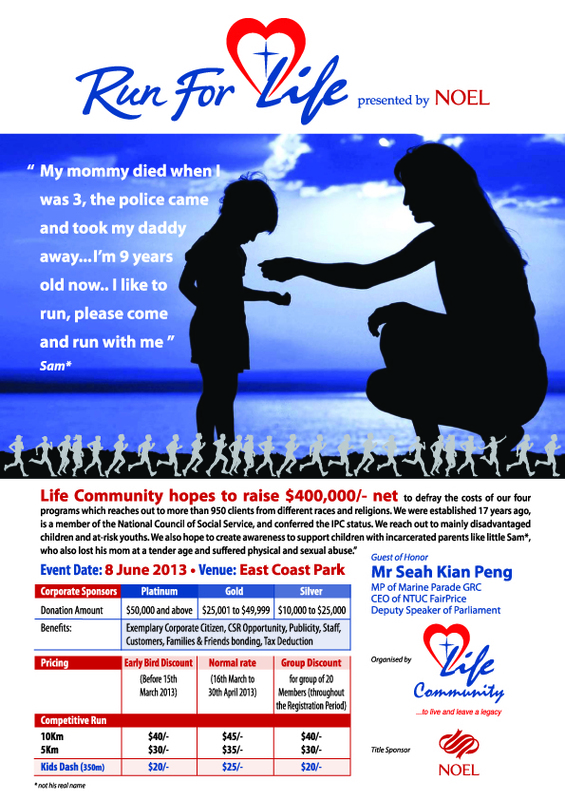 Run For Life! 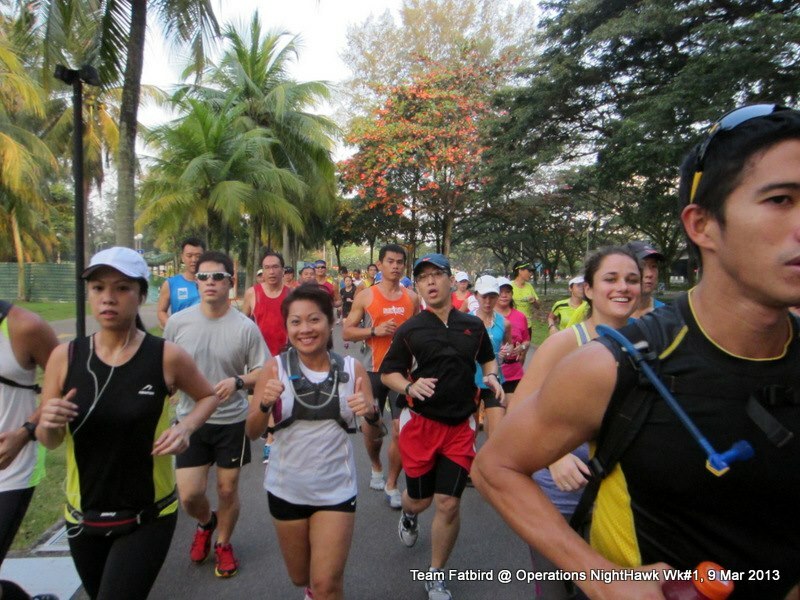 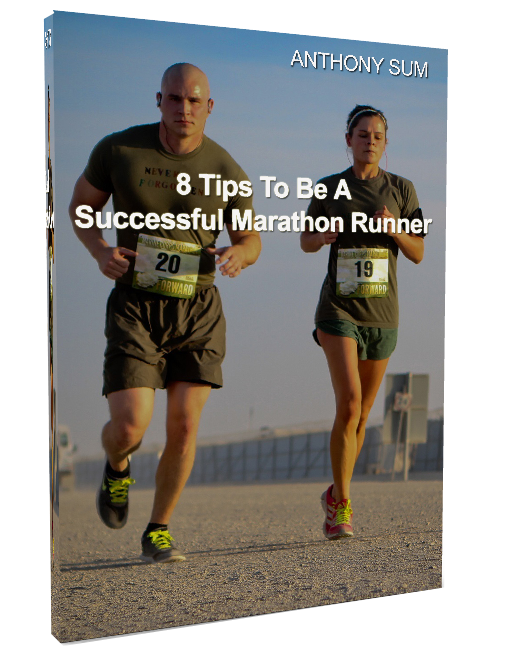 Have you benefited from having a healthy and happy life, and wish to give back to the society via running? 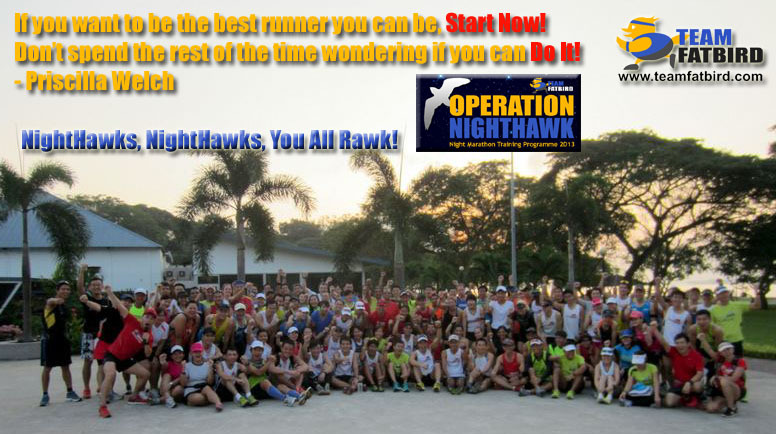 Here’s a good opportunity to do your bit for a very meaningful and charitable cause! Calling all Team FatBird runners, friends and the running community to participate in this RUN event to help disadvantaged children and at-risk youths. 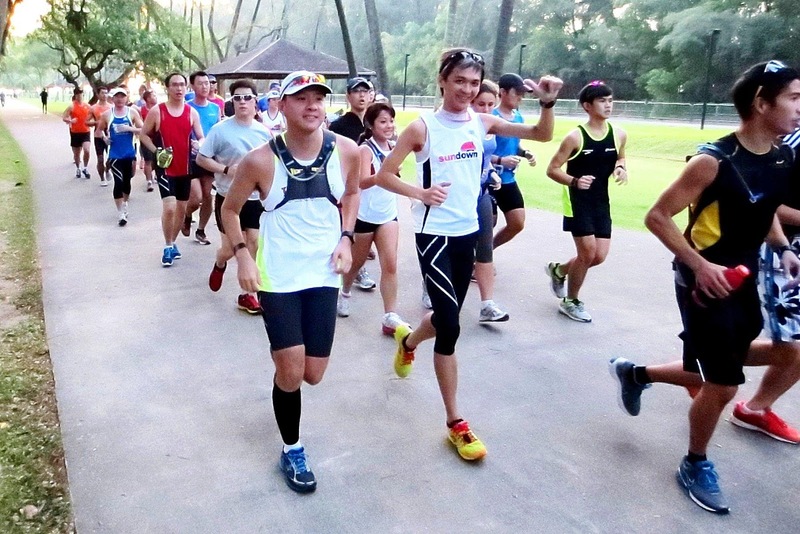 Run for this meaningful and charitable cause which will go a long way towards funding the support for Sam and his friends. Check out Sam’s story and join us to RUN FOR LIFE!